David and Maria did the dishes. Myla started to remind David that the house had a dishwasher, but she watched the two of them trying to talk to one another, and she decided to leave them alone. Theresa and Cathy sat in the living room and discussed job possibilities. Luisa and Stefan played cards at the kitchen table. Lily watched. “What are you playing?” Myla asked. “Yeah, it’s kind of boring with just two players,” Stefan said. Stefan handed it to her. She opened it and pulled out the joker. “Let’s play Old Mermaids instead,” Myla said. “Oh here we go!” Theresa said from the couch. She and Cathy got up and came over to the table. “We need thirteen mermaids,” Myla said. “It’s a nice round number,” Myla answered. “Is she making this up?” Luisa asked. “I’m remembering it as I talk about it,” Myla said. “She does that a lot,” Theresa said. “Shall we play?” Myla asked. “These look like mermen, not mermaids,” Luisa said. “Where do you think little mermaids come from?” Stefan asked. “You mean draw on them?” Stefan asked. “Do whatever you like with them,” David said. “I’ll come with,” Luisa said. “Me, too,” Stefan said. Luisa gave him a dirty look. Lily slipped her hand into Luisa’s. “We’ll have an expedition then,” David said. They disappeared down the hall. “Uplifting story, Ernesto,” Theresa said. A few minutes later, David returned with the children. Luisa carried a cardboard box. She set it on the table and took off the lid. “I thought you got a degree in art education,” Myla said. “Didn’t pan out,” he said. “Some of these babes are going to have mustaches,” Stefan said, holding up a Jack. “Some of the best women I know have mustaches,” Myla said. Cathy and Theresa made coffee while everyone else sat around the table with the face cards. Luisa began coloring on a queen. Stefan took a jack. Lily a king. Lily asked her mother what she was supposed to do. “We’re making them into Old Mermaids,” Maria said in Spanish. Soon, the table sparkled with glitter. Sticky glitter. Luisa used sequins to approximate the scales on the Old Mermaid’s somewhat truncated tail. Lily glued sequins everywhere and then added glitter. Maria shredded ribbon David found in his mother’s sewing basket and made it into hair for her mermaid. Ernesto drew in a hammer and nails. “Someone has to do the work around the sanctuary,” he said. David’s mermaid seemed to get darker and darker the longer he worked on the card. Stefan colored in the mermaid and then added more figures so it looked like a tiny mural. “I wish these cards were bigger!” Luisa said. Myla walked around the table and looked at the artwork. “She was wise and beautiful,” Luisa said. “I’ll take everyone home,” Theresa said. Myla glanced at Luisa who was putting the supplies back into the box. She was sharp as a tack, this one. “Yeah, us too,” Stefan said. Luisa shrugged. “Whatever. See you later, gators.” Her mother handed her the empty bowls. “Can I say good night to the mermaid in the pool?” Lily asked. “Because the water is deep,” Maria said. “The Old Mermaids said they would teach me to swim,” Lily said. The girl took Myla’s hand, and they walked through the living room out to the patio. The pool light was the only illumination. The two of them walked to the edge of the pool and looked down at the mermaid. After a few moments, Lily began nodding, as if she were listening to someone speak. Myla sat near the edge of the pool. Lily sat next to her. “What are you listening to?” Myla asked. “The Old Mermaids,” she said. “Oh? What are they saying?” Myla asked. “A not-be-afraid song,” Lily said. “What is it?” Lily asked. Myla carefully took the dreamcatcher earring from her pocket. She handed it to Lily. “Sometimes when I open my eyes in the dark, I see it all moving,” Lily whispered. “The Old Mermaids don’t have tails any more?” Lily asked. The girl let go and ran to her mother. “Good bye, Myla!” she heard the others call. Myla waved, then looked down at the mermaid in the pool. She was suddenly very tired. She wasn’t sure she was up for her yearly sojourn with George tomorrow. The patio door opened and closed. Myla looked up at David. He sat next to her. She put her hand on his back. He smile and took her hand in his. “Sorry about that,” David said. “Sounds like it could be interesting,” Myla said. “So you’ve taken a break from all that?” Myla said. “No, no,” David said. “That was it. I think I’ll go in now. You don’t need to clean up. I’ll do it in the morning. It’ll give me something to do.” He stood and reached a hand down to Myla. She took it and let him pull her up. George knocked on Myla’s door too early the next morning. When she didn’t answer it, he opened it and came in to the apartment. Myla covered her head with a pillow. George whistled. Myla sat up and pushed her hair out of her eyes. George sat on the bed and opened the white sack. He reached in and pulled out two boiled eggs. He tossed one to her. She tapped it against the wall until it cracked and then began pulling the broken shell off of it. “George,” Myla said just before she bit into the egg. Myla got out of bed and took off her red cotton pajamas. She didn’t care that George watched while he ate a bagel and gulped coffee. He watched her like she imagined he watched a football game or an animal crossing the road in front of him: with interest but without enthusiasm. “I like your curves, woman,” he said. Well, maybe she was wrong about the enthusiasm. She pulled on a pair of slacks and tucked her camisole inside them. Then she took a purple shirt from her small closet and put it on. “He got that right,” George said. “What made you think of David Crow?” Myla asked. They drove to their old neighborhood. Brick houses predominated, making it look like a suburb in the Midwest. Or someplace like that. Myla had never actually been to the Midwest. She only knew these houses did not look like desert houses. She wondered why she had ever agreed to live here. Had she actually liked it? George slowed the car as he turned the corner onto their old street. He parked two houses away from his old house, three from her old house. Her ex-husband’s car was in the drive. At least that was the car he had last year. Several plastic children’s toys were strewn around the yard. They had finally taken out the grassy lawn and replaced it with rock. About time. George relaxed against his seat and lifted a cup of coffee from the paper sack. Myla didn’t say anything. She stared at the house. Would her ex look different this year? “Only the Madonna isn’t naked,” George had said. Something about George’s voice had woken her up then. She had blinked and realized her naked husband was getting dressed, and Nadine was crying. Now Myla felt a tickle in her stomach. Then Richard—Myla’s ex—stepped outside onto the steps and shut the door behind him. Nadine looked back at him and smiled. Myla could see his lips moving. He looked old enough to be Nadine’s father. She was what now? Thirty-five? And he was fifty-five. Myla had been twenty-three when she and Richard married; he had been over thirty. Both old enough to know what they were doing. The family got into the car. The girl laughed. Or whined. Myla couldn’t be sure. “I thought you didn’t want children,” Myla said. The car backed out of the driveway. Then they drove by Myla and George. George stared right at Richard, but he was talking and looking ahead. “God I hate him,” George said. “No, you’re not,” he said. She put her hand on the door handle. “I am. I want to see it. It was my house. The only house I ever owned. I feel as though I was evicted and never got a chance to say goodbye.” She didn’t know if any of what she said was true. Maybe she had said goodbye. She could not remember any quiet contemplative moments from that time, but that did not mean she hadn’t had any. What she did remember was that it had been her home and then suddenly it wasn’t. After she saw Richard and Nadine in bed together, the house had felt contaminated, and she had to leave it. Myla got out of the car. She crossed the street, went up the driveway, and through the paved path between the carport and the house around to the back door. She stopped for a moment and breathed deeply. Then she went up the steps and opened the screen door. Then she put her hand on the back door knob, turned it, and pushed the door open. She stepped into cool semidarkness and quietly closed the door. The house pulsed with silence. On her tiptoes, Myla walked across the kitchen to the living room. Different furniture and arrangement. Same coffee table. The house looked familiar but different. Smaller. Stuffier. She walked down the hallway. Four doors. Two closed. Two open. The first closed door was the bathroom. She carefully opened the door and looked inside. She didn’t recognize anything. It had been redone in red and white. She shuddered and closed the door again. The second closed door was what she and Richard had used as a guest bedroom. She opened it. Now it was a little girl’s room. Pale blue and white. A small canopy bed. A little dressing table. Someone had painted pastel-colored stars on one wall. It was a beautiful room—cluttered and messy—just like a young girl’s room should be. She closed the door again. Now she was at the end of the hallway. The master bedroom. The door was wide open. There was the bed. It looked like the same bed. Same headboard. Was that possible? Richard was extremely frugal. Cheap, actually. He never replaced anything until it broke. Nadine had probably wanted to get rid of the bed he had shared with Myla for fifteen years, but he wouldn’t do it, Myla guessed. She stepped into the room. Their old dresser was still here. She had found it at a garage sale. Beautiful old oak dresser. Richard hadn’t wanted it. She insisted—one of the few times in her marriage that she had insisted. Ordinarily when they disagreed about something, she usually gave up—worn down by their “discussions” which usually consisted of him haranguing her until she came around to his viewpoint, or at least she pretended she did so she get him to shut up. When she married him, she had thought he was a great debater, a man with an intellect. She shook her head. Had she really ever been that naive? She ran her hand over the top of the dresser. She should have taken this with her. She had not taken much—only her clothes, gardening tools, books, and a few pots, pans, dishes. She walked to the bed, put her hand on it, then sat on it. She bounced on it, slightly. Then she lay back and looked at the ceiling. It was comfortable. They must have gotten a new mattress. She closed her eyes. Someone was in the master bathroom. Right behind her. She jumped up and ran out of the room. “Is someone there?” A woman’s voice. Myla ran through the living room and into the kitchen. Then she stopped. She couldn’t help it. She stared at the tiled kitchen wall. Her tiled kitchen wall. When she and Richard had first moved into the house, they had decided to put in a tile backsplash. She had wanted to tile the whole wall beneath the cupboards and above the sink, but she hadn’t been able to convince Richard. He thought it would be too expensive. One day he took her into the back room of the shop. “I have a surprise for you,” he said. He opened up a box of tiles. Myla began pulling them out. Some were indigo blue, others were light green, and others had seashore scenes painted on them: sea shells in the sand, clams, starfish in the ocean, sea gulls against a blue sky. “These will be big sellers,” Myla told him. Myla had finally agreed. She and Richard had tiled the wall themselves. Now Myla walked closer to the wall, her hand outstretched. She walked until her fingers touched one tile over the sink, at the center, right above the faucet: a tile of a mermaid. Until she forgot to look? Myla turned around. An older woman stood in the kitchen behind her, holding a phone. “I’m going to call the police,” she said. “Est Sunday? Oh! I’ve missed mass then! Lo siento, lo siento!” Myla hurried out the back door. She ran around the house and across the street to George’s car. “Why? Did you steal something?” He started the car. George quickly drove them out of the neighborhood and onto a main street. “Who was it?” George asked. “That’s kind of creepy,” George said. “So what if there was a mermaid?” he said. She closed her eyes and leaned her head against the window. She had had a mermaid in her previous life. How could she have forgotten that? 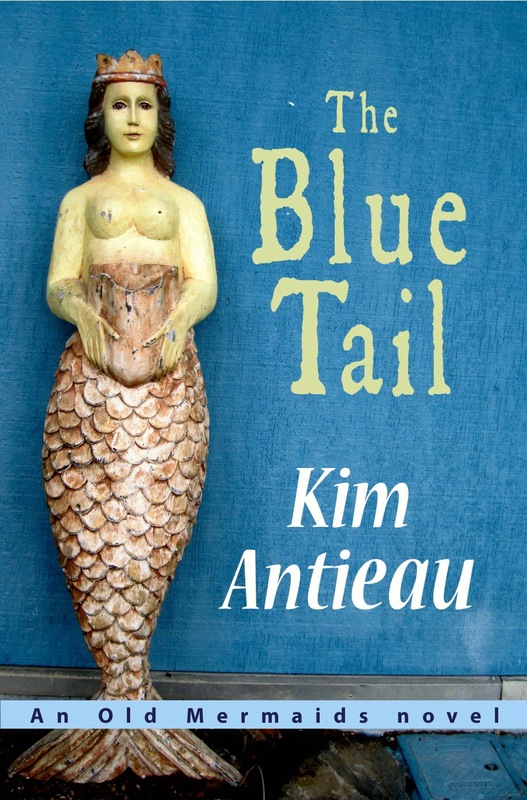 For the last decade she had been certain that the Old Mermaids were only part of her new life—conjured to save her, to help her reclaim her life and find purpose. The Old Mermaids had absolutely nothing to do with her old life. 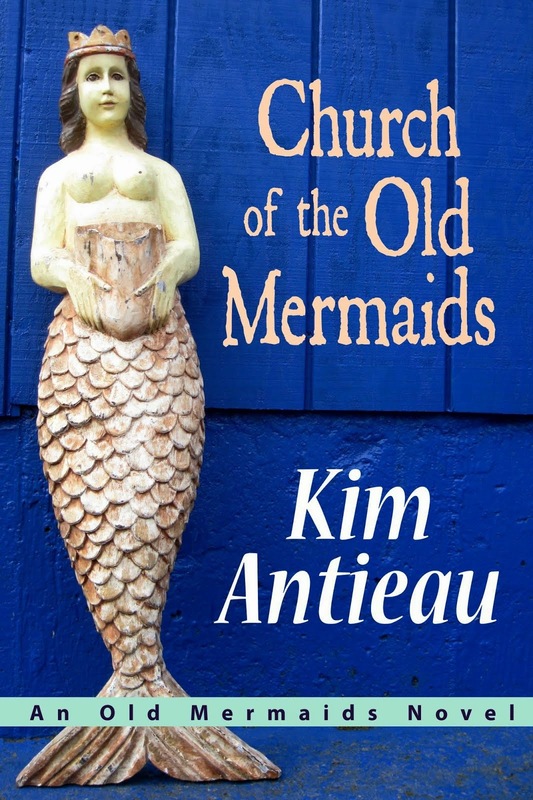 When she first started the Church of the Old Mermaids—after the dream—she saved the money she earned. It wasn’t much, but she knew she would figure out what to do with it eventually. One day during a trip out into the desert searching for treasure, she saw a group of people in the sandy bottom of an old wash. She went over to say hello. Three men, a boy, and a woman sat on the dirt, too exhausted to move. Myla immediately offered them water. They gave it to the barely-conscious woman first. Myla wanted to take them to the hospital, but they refused. Once they drank the water and ate the food she gave them, they revived. They had crossed the border illegally, as she guessed, and had been deserted by their smuggler—the guia—soon after they crossed. Myla took them to her apartment in the Crow barn, fed them, and let them use her phone. The woman—Grace—was too ill to leave with the others, so Myla let her and her son, Roberto, stay. She didn’t even think about it. She got her keys and drove them over to the Ford place and let them sleep there. The Old Mermaid Sanctuary—in its present form—was born. Two days later, using some of the money she had earned from the Church of the Old Mermaids, Myla bought Grace and Roberto bus tickets to Texas where Grace’s husband worked in the fields. After taking them to the bus station, Myla came home and went to the Ford house to clean it, but the house was spotless, the garden tidy, the dirt raked. Myla believed the house felt better too. Which was how it should be, she decided. A house was created to be lived in. That was its purpose. When the Fords returned, they even remarked that the place had never looked better. Myla kept making excursions to the desert, near la frontera. Sometimes she found people, sometimes she did not. She was careful about who she brought home with her and even more careful about who she let stay in the houses. When she told Theresa what she was doing, Theresa offered to help. Myla was glad to have her as a partner, especially since Theresa was a private investigator and many of the migrants came looking for family, friends—and a job. After a while, Theresa and Myla began going to the desert together, mostly in the summer when it was so dangerous for those crossing. In recent years, they sometimes encountered people from Humane Border, who left water in the desert for the migrants, or the No More Deaths volunteers who sometimes transported migrants to the hospital, all activities which had been deemed legal until recently. A few months earlier a couple was arrested as they drove several people to an area hospital. They were charged with aiding and abetting illegal aliens. Or something like that. Myla knew if she got caught, she wouldn’t be able to help anyone, so she and Theresa kept quiet about what actually went on at the Old Mermaid Sanctuary, and they avoided the other rescuers as much as possible. In the winter, the Sanctuary was usually quiet, except for visits from the homeowners. Summer was busier. Myla made certain each house was not occupied often or for very long, and visitors always did work around the property in exchange for their room and board. One year a family retiled the Castillo roof. Another time, a man helped fix the greywater irrigation system at the Ford house. Myla told the migrants that if anyone happened to see them and ask what they were doing there, they were to say that Myla had hired them. After all, the homeowners had instructed her to keep up the yards, facilitate repairs, and make the houses looked lived in. Myla made certain all that happened—only the workers stayed in the houses while they did the work. Myla kept an Old Mermaid Sanctuary binder. In it, she put photos of the visitors with their names, ages, which house they stayed in and what work they did. Almost always, the migrants sent Myla a postcard once they were settled, and she’d add those to the binder. Now after seeing the mermaid tile in her old house, Myla wondered about her raisin d’etre. Maybe the Old Mermaid dream had only been a bit of undigested memory making itself a character in her vision. Maybe she had concocted the Old Mermaids as a way of hanging onto some shred of her former life. George stopped the car. Myla looked up. They were home. “Maybe sometime we can go on a real date,” Myla said. Myla leaned over, and they kissed. “See you later,” Myla said. Myla got out of the car and then shut the door. As George drove away, she stood in the drive listening to the silence for a few minutes. Then she went to the edge of the wash, stepped down onto the sand, and walked unsteadily until she came to a wide stretch. She looked north, and she looked south. The wash disappeared into desert trees. She looked east, and she looked west. What if it had all been a dream? No call to action. No cosmic message. Only a dream. She heard crunching in the wash and turned in the direction of the house. A moment later Gail came around the palo verde bend; Theresa followed. “I figured you’d be here,” Gail said. “David said he’d seen you go this way,” Theresa said. “You two together?” Myla asked. “No!” they said at the same time. Myla turned around again and kept walking. “I don’t feel like a movie,” she said. “I did go to the house,” Myla said. “Why on Earth would you go back there?” Theresa asked. “Do you remember we redid the kitchen soon after we moved in?” Myla asked. She stopped and turned to her friends. “You remember that?” Myla asked. “Probably just because I thought it looked stupid,” Gail said. “Do you remember there was a mermaid tile?” Myla asked. “Why would you want anyone to tell you what to do with your life?” Theresa asked. “I think I know what you mean,” Gail said. “You always want to talk about everything,” Gail said. “No, not the Old Mermaids,” Theresa said. Gail and Theresa came up beside her. Directly in front of them was a shoe in the sand. “Looks like a dog gnawed it all to bits,” Gail said. “It’s more like someone lost their soul,” Theresa said. “You mean you aren’t going to take it?” Theresa said. “No,” Myla said. She stepped over it and kept walking. Myla groaned and turned around. Ordinarily, she was a patient and good-natured woman. Beyond her friends she could see the log wrapped in orange rope. Maybe it was time she unraveled that rope because she suddenly felt at the end of hers. Just then, David came into view. He stepped over the log. Luisa scrambled behind him. “You remember him after all these years?” Myla asked. “You were just talking about him yesterday,” Gail said. “She was talking about me?” David asked. “You’re the one who painted the mermaid in the pool,” Gail said. “You painted that mermaid?” Luisa asked. “Myla said that last night,” Theresa said. “In any case,” Myla said. “What does extrapolate mean?” Luisa asked. “I just used it in a sentence!” Myla said. “Could you use it in another one?” Gail smiled. Myla started to laugh. Soon the three women were giggling. Luisa and David watched. “All right,” Gail said. She embraced Myla. “I love you too,” Gail said. The two women and girl walked away together. Myla stood still until she no longer heard their voices. David looked down at the shoe. “A sole,” David said. “I wondered where I had lost that. Just what I needed.” He picked it up. “See you later, Myla Mermaid.” Then he turned and left Myla alone. That was just what she needed.